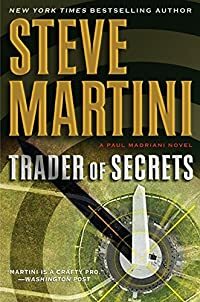 Trader of Secrets by Steve Martini, a Mysterious Review. Review: California defense attorney Paul Madriani is on the trail of a killer-for-hire, one who has promised to take vengeance on Madriani by killing his daughter Sarah, in Trader of Secrets, the twelfth thriller in this series by Steve Martini. Liquida Muerte's trademark weapon of choice is a stiletto, and he's already used it on Paul's investigator Herman Biggs, nearly killing him. But Liquida's real target is Paul's daughter, Sarah, who has been sent for her own protection to her aunt and uncle's farm in Groveport, Ohio. Believing that she's safe, Sarah leaves the house one day, just for a walk, only to find Liquida waiting for her. But while Sarah is a personal target for him, there's no money in it … and money is what really drives him. He's been hired to find two missing NASA scientists, who have stolen valuable information that is now on the market to the highest bidder. Paul's search for his daughter inevitably leads him into a quest to stop from falling into enemy hands what could be a weapon that destroys the world. On some level there's a wide disconnect here between Martini's earlier legal thrillers featuring Paul Madriani and Trader of Secrets, which seems to be a continuation from the previous book in the series — Liquida and Paul have a previously existing adversarial relationship — and is, itself, far more of an international political thriller than a legal one. Readers expecting courtroom theatrics will be sorely disappointed. Still, it's hard not to get caught up in the excitement as the action moves across country then around the world, and Paul and company are an entertaining group to spend time with, though the whole doomsday plot seems overwrought and really rather overdone. What Paul really needs now is to return to California and for a nicely convoluted case to land on his desk, one that takes advantage of his brilliant legal mind. Special thanks to guest reviewer Betty of The Betz Review for contributing her review of Trader of Secrets. Acknowledgment: HarperCollins provided a copy of Trader of Secrets for this review.